Art is not always about pretty things. It’s about who we are, what happened to us, and how our lives are affected. The National Parks system is widely hailed as America’s best idea. The next best, in my opinion, is the Smithsonian Institution. The Institute funds and runs many engaging museums in the capital, charging no admission fee to the millions of visitors who are educated and entertained by their collections. The Smithsonian also funds and operates a multitude of educational offerings, research centers, and cultural centers. It is an amazing national resource and deserves our support and gratitude. Most of the museums are on or near the Mall in Washington. You could tour exhibits all day for several days and not exhaust the possibilities (only yourself). Treasures of art, sciences, history, and technology are all here. The Hope Diamond, the First Ladies’ dresses, the “star spangled banner” that flew over Fort McHenry, the space shuttle Discovery, and the pandas at the National Zoo (also part of the Smithsonian) are my top memories. Who knows how much they have in reserve if we just dig a little deeper? On our recent visit we went to the new Air and Space Museum Steven F. Udvar-Hazy Center outside the city near Dulles airport. Like the original Air and Space museum on the Mall, this exhibit presents dozens of flying machines, many of them in very dynamic poses of flight. The jumble of “things in the air” made me wonder what happens at night when no one is watching. Do they all spring to life, zoom around to get the kinks out, then resume their positions at dawn as the guards arrive? It’s no surprise that others have had the same thought and made it into “Night at the Museum: Battle of the Smithsonian,” incorporating several Smithsonian collections with that question in mind. The scope and arrangement of the museum makes amateur photography difficult. 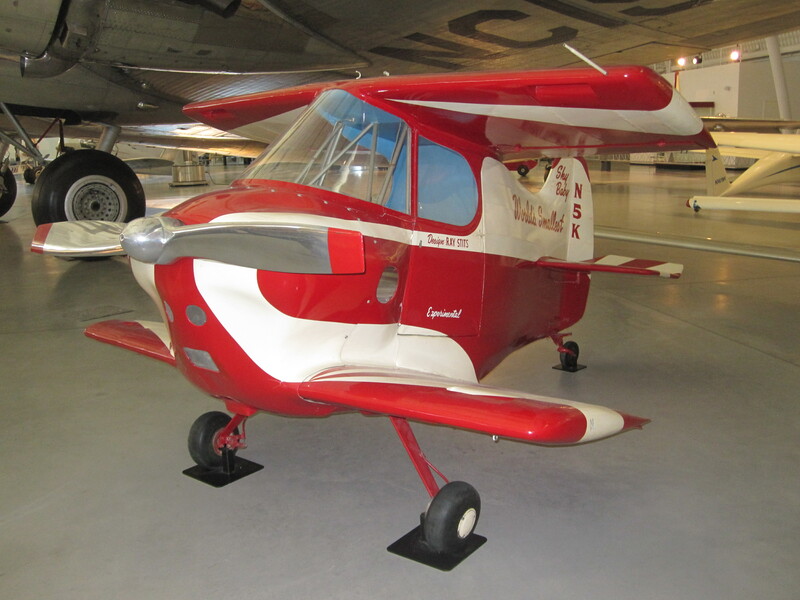 The only machine I could get a decent picture of was “The World’s Smallest Airplane.” Who would fly this plane? There is no room for a passenger so the thrill would be all your own. It looks to me like something out of “Who Framed Roger Rabbit?” or “Cars.” And I saw it at the Smithsonian! This entry was posted in Travel, Uncategorized and tagged Air and Space Museum, Enola Gay, Night at the Museum, Smithsonian, space shuttle, SR-71 Blackbird, travel, Udvar-Hazy Center, Washington, world's smallest plane. Bookmark the permalink.